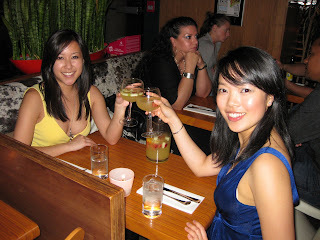 MizzJ and I toast each other with white sangria at Baru Latino. Last Saturday, MizzJ and I went out for our much-anticipated Dine Out Vancouver reservation at Baru Latino, followed by clubbing at Bar None in Yaletown. We knew that the evening would have excellent food and fun in store for us, but little did we know that it would also be rife with one-liners and random absurdities. This is just a small sampling. "For God's sake, could whoever is standing by the door PLEASE move?!" MizzJ: "He told me his perfect movie would contain 'explosions and boobies and ninjas and zombies.'" Me: "What about zombie boobies?" MizzJ: "That's what I asked him! And he said those didn't count because they'd be decaying and gross." Random guy on the street: "Hey! Hey, wait! (Runs up to us and puts his arms out, blocking our way.) I don't mean this to sound weird, but I just wanted to tell you two ladies that you're very, very beautiful. Wait a moment, this is my friend here." MizzJ: "Wow, that was so weird! That's only the second time that's ever happened to me." Me: "Really? What was the first time like?" MizzJ: "Well, I was in Victoria and this random guy on a bike cycled past me and he backtracked and was like, 'Excuse me, I just wanted to stop and tell you that you're very beautiful.' I panicked and said, 'I have a boyfriend, I'm going to his place right now, and he knows kung fu!!'" "Take your coats off. You'll get in faster." "Okay, that guy just totally looked down your dress." Inside Bar None. We were pretty indignant over the long wait. Me: "I hate dancers with flailing limbs." MizzJ: "I know! Picture a bar half this size with twice as many flailing white people and that's exactly what Victoria is like." "Dancing next to this guy is like dancing next to a wall!" MizzJ: "Ohmigod, he's so into you! He was smelling your hair!!" Me: "I know. I could feel the back of my head hitting his forehead whenever I moved. I felt kind of bad for him actually." Me: "Does he count as Mr. February?" MizzJ: "No, because technically this evening is still part of January. January 31st isn't over until you sleep and the next day comes." Hahaha, you two are a peach of a pair. Sounds like rollicking good time! You guys look fantastic, and yes, so complementary. yup both of you look gorgeous! and complimentary! OMG I LOVE THIS POST. We are freakin hilarious hahahahh. I'm saving this for posterity. Sorry, but my "complementary" post on this night will be put up later today. I was in a pasta coma last night so forgot to post - I actually ate more than Zombie Boy!! HAHAHAHAHAHA. I just about died laughing reading these quotes! 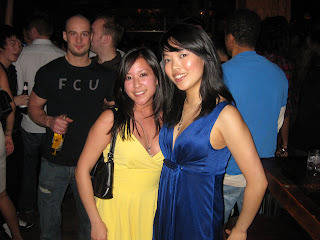 The blue dress looks great on you! Perfect color. You two look so beautiful that I just want to smell your hair. Judging by your one-liners it sounds like a hilarious night! Definitely makes me want to go out! heehee, sounds like you gals had fun and you both look divine. you & mizz j are so fabulous & gorgeous! You guys are so cute! And you sound just like my friends and I when we're out.